Cement Clay-- Water/Aqua/Eau, Lanolin Wax, VP/VA Copolymer, Beeswax/Cera Alba, Tribehenin, Bis-Diglyceryl Polyacyladipate-2, Cetearyl Alcohol, Petrolatum, Ozokerite, Vinyl Caprolactam/VP/Dimethylaminoethyl Methacrylate Copolymer, Ceteareth-20, Alcohol, Denat. Super Hold-- Water (Aqua), Ceteareth-25, PEG-7 Glycerl Cocoate, Polysorbate-20, PVP, Propylene Glycol, PEG-7 Hydrogenated Castor Oil, PEG-8 Beeswax, Fragrance (Parfum), PEG-8 Methicone, DMDM Hydatoin, Methylparaben, Red 4 (CI 14700), Yellow 5 (CI 19140). 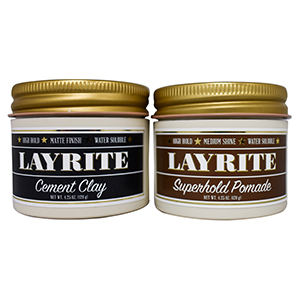 Cement Clay: Rub a small amount of Cement thoroughly between palms until product softens. Distribute evenly through damp or dry hair and style as desired. The drier the hair, the higher the hold, the more matte the finish. Super Hold: Apply a small amount, known as a dab, to palms. Distribute evenly through damp or dry hair and style as desired. Wet comb or fingers and run through hair to restyle anytime. Rinse out with water alone.